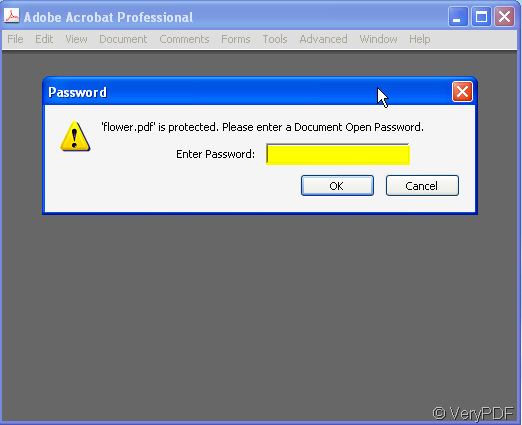 ← How to modify pdf creator information by using The Advanced PDF Tools? What are the differences between 40 or 128 bit encryption? How can I add encryption to my file? Encryption is a way to protect the transmittal information by scrambling of information. There are two levels of encryption in general use: 40-bit and 128-bit. With 40-bit encryption, there are billions of possible keys to decipher the coded information, and only one of them works. The effectiveness for encryption is measured in terms of how long the key is -- the longer the key is, the safer it is. It would take much longer time for someone without the correct “decoder” to break the code. This is measured in bits: 40-bit encryption, the level of encryption used with many ordinary browsers. As to 128-bit encryption, there are 300 billion trillion times as many keys as with 40-bit encryption. It is quite hard for an unauthorized party to find the right key, even if they are equipped with the best computers. 128-bit encryption is the strongest form of encryption available for financial or confidential transactions over the Internet. If you want to add encryption for your file, you can try this way. No matter what form of file is,you can make them to image format. Say paper file, scanning is OK, files in computer, taking screenshots is available. 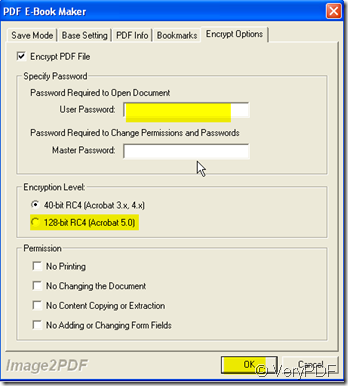 Then you can make the image to PDF file and set a high level password for it by Image2PDF. It would be very safe. Image2PDF is a convert which can convert dozens of image formats, into PDF format. Image2PDF can automatically clear and skew-correct B/W images by employing special techniques to insure high quality output after conversion. Then Let’s see how to use it. Make the image file version for your file, then add it to Image2PDF. I take a random image file for example. 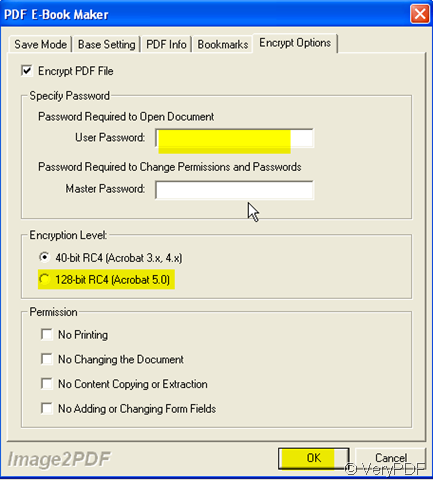 As you want to set the password for your PDF file, please set it by clicking “Setting” then go to “Encryption Option”. According to your needs to set the password. Say you want to set two kinds password: One is for the opening right the other is for the right to change the permission. And two level encryption “One is 40-bit and the other is 128-bit. Of course, as I stated above, the longer your password is, the safer your file is. But you have to input it yourself too when you check yourself. It is a little complicated. After setting, please click “Make PDF” to finish the conversion. 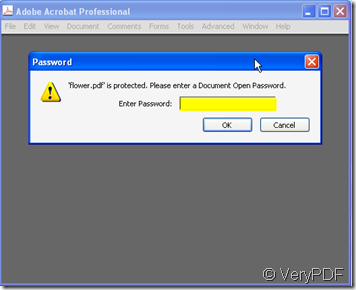 A few seconds later, you will see your file has been converted to PDF file and if you want to read it, you have to input the password yourself. What’s API for converting Word docs to PDF that does NOT require Office to be installed? How to insert the paper document content to my PDF file? How to convert PSD image to PDF file by command line?